A special place in the Belarusian calendar belongs to religious holidays. And it does not matter whether it is Catholic or Orthodox holidays - they are widely celebrated in every home, they are well-liked in each family, as they strengthen family ties and fill our hearts with the light and purity. Therefore, they are sometimes fairly called family holidays. January, 7 - Christmas (day off). One of the major religious holidays of Orthodox Christians. The history of the holiday is associated with the birth of the Christ Child Jesus Christ in Bethlehem. According to legend, Jesus Christ was born from the Immaculate Virgin Mary and his birth was a supernatural phenomenon in the human world. The holiday of Chistmas is preceded by the forty-day Christmas fast (the holy Lent), the day before a strict fast is observed. Just after Christmas, Christmastide comes - 12 holy days, during which the celebration of Christmas is still going on. On the day of the holy festival, the Orthodox churches hold Christmas service, which gathers many faithful. After a celebratory worship all family members come for a family dinner, where you can refresh after a long post. January, 19 – the Holy Theophany of Our Lord Jesus Christ. One of the most ancient Christian holiday that has its roots in the days of the apostles. The Orthodox Church celebrates the Holy Theophany on January, 19. The day before – on January, 18 - a strict fast is observed. Historically, the holiday is associated with the baptism of Jesus Christ in the waters of the Jordan River by John the Baptist. The Greek "baptize" is translated as "submerge in the water." In the Old Testament, the water has a sacred meaning, symbolizing the beginning of life. The Old Testament says that all living beings came out of the water, fertilized by the Holy Spirit. The second name of this holy day – the Epiphany, relates to the fact that at the time of the baptism of Jesus Christ the Holy Trinity was showed to the world: God the Father, God the Son and God the Holy Spirit. On the eve of the holy festival, water is sanctified in the Temples, which is distributed to the faithful for domestic religious rituals. The Epiphany water is considered especially healing, can be stored for years and not spoil. It is used to treat a variety of ailments, and sprinkle the house with this water. In the Holy Theophany, many believers in Vitebsk exercise ritual ablutions in the hole, polynyas, holy springs. As a rule, they make a hole in the ice in the form of a large cross. This tradition symbolizes not just cleansing of the body and the human spirit cleansing from sins. March, 11 – the Pancake Week. The Pancake Week is celebrated during last week before the Lent. This is a fairly ancient festival, which has come down to us from the pagan times yet. In different parts of the country it is called by different names: "obeduha", "sugar lips", "kasatochka" etc. As in the past, today, the Pancake Week is a symbol of the awakening of the nature after winter, as well as a kind of a sign of the beginning of spring field work. To make the future year fruitful, the Pancake Week should be satisfied, fat and rich for dishes. There is a legend associated with this spring holiday, according to which those who spent the Pancake Week idle and bored, will be pursued by failures throughout the whole year. After the adoption of the Christianity in Russia, this popular festival has not exhausted, but preserved, and from the XVI century, it had the other name – the Pancake Week. As a rule, during Pancake Week, all people spend the winter together, even the pancakes, which are an indispensable attribute of the holiday, symbolize the sun - so hot, ruddy, hot and hot. The Pancake Week is celebrated for seven days - and everyone has not only a name, but also a certain meaning. Monday – a meeting. On this day, a dressed up straw man of Maslenitsa (the Pancake Week) was set on a hill, where mass celebrations began with songs, dances and sledging. Tuesday - start of merriment. From that day the folk festival gained momentum. In the streets there were mummers, who organized small performances. Wednesday - sweet-tooth, fracture. Treating with pankaces and other tasty food started on Wednesday. Thursday – walking-chetvertok. The most disturbing fisticuffs happened in the middle of the spring holiday. On Thursday, people burned fires everywhere; men and women were jumping through the fire and rode horses. Friday - mother-in-law parties. On this day sons-in-law invited their mothers-in-law for pancakes. If a son-in-law ignored that day for any reason, it could become an undoubted and indisputable cause for the eternal enmity with the aggrieved mother-in-law. Saturday, inviting all relatives on a visit. Sunday - forgiveness day. On the last day of the Pancake Week relatives and friends apologized each other for injuries caused. Vitebsk citizens and guests particularly appreciate the final end of the event – farewell to the Pancake Week. The scarecrow, which people solemnly dressed up and went with it everywhere before, is killed and burned at the fire under the universal joy. People also throw old things and clothes into the fire sometimes, which is a symbol of renewal, a new life, and the early arrival of spring. Traditional dishes for the Pancake Week are pancakes, oatmeal and cranberry jelly, curd patties and scone. March, 17 – the Shrove Sunday. The Shrove Sunday is usually celebrated on the last day of the Pancake Week. According to the tradition which has come down to us from the ancient times, people on this day ask friends and family for forgiveness for injuries caused. The Orthodox Christians still remember the Shrove Sunday as the time the expulsion of Adam from the Paradise. Therefore, this day associated with repentance, forgiveness, suffering and necessarily from time immemorial. The Orthodox treat it as a preparatory period before the Lent. Although the history of this holiday has deeper roots. The tradition of asking for forgiveness for any wrongs and sins committed moved to the calendar Belarusian holidays from Egypt. Local monks for 40 days went to the desert before the Easter. All the while they were praying God, cleansing themselves before meeting with Christ in the celebration of his resurrection. And the desert hides a lot of dangers - animals and poisonous snakes. So, knowing that there was a risk not to return home, the monks before leaving asked the relatives for forgiveness not only for injuries caused, but also for the bad thoughts that had ever occurred in their heads. May, 5 (the date for 2013, the date changes) – the Orthodox Easter. 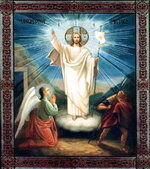 The Easter, or the Resurrection of Christ, is the biggest and the brightest Orthodox holiday. People greet each other joyfully shouting, "Christ has risen!" And the answer is no less solemn «He has truly risen!" As a rule, the celebration of the Easter begins with a divine service, which takes place from Saturday to Sunday. The Orthodox take coloured eggs, cakes and other foods for the consecration during the holiday. In Christianity, the Easter symbolizes the transition from death to life and from the earth to the heaven, this is a clear evidence of the soul immortality. The Orthodox usually prepare to celebrate the Easter in advance. They paint eggs, bake cakes, prepare cottage cheese Easter cake and thoroughly clean the house. Every woman treated this church festival with special attention, trying to make as many dishes as possible not to feel the need throughout the year as people believe. Sometimes the Easter is called a family holiday. And it is quite true. On this day, all the family members get together, encouraging each other with warm words and heart talks. An essential symbol of the Easter and a new life is the red eggs. The red colour also symbolizes the blood shed by Christ, in the name of the redemption of all mankind. It is believed that the tradition of painting the eggs appeared thanks to Mary Magdalene, who, knowing that Christ has risen, visited the Emperor Tiberius, and putting a egg said, "Christ has risen!". But the governor did not believe it - and at the same moment the egg became red. May, 14 (the date for 2013, the date changes, day off) – Radonitsa. All Souls' Day was set by the Orthodox Church on the second Tuesday after the Easter. Usually on this day the believers go to the graves of deceased relatives, to share the joy of Easter with a memorial meal together with them. June, 23 (the date for 2013, the date changes) – the Day of the Holy Trinity. The Orthodox Christians celebrate this religious holiday on Sunday, 50 days after the Easter. The history of the holiday says that this day the apostles beheld the Holy Spirit. It took the form of a miraculous flame that gave a bright light, but at the same time not burn. Immediately upon the Christ`s people got the ability to speak different languages, so that they could preach the word of God among different nations. In the Day of the Holy Trinity, according to an ancient tradition people decorated churches and homes with greenery and flowers. 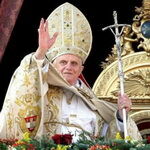 March, 31 (the date for 2013, the date changes, day off) – the Catholic Easter. This is one of the brightest and most fun holidays for the Catholics. Easter morning begins with solemn liturgy with exciting sounds of the organ. This day the faithful come to the Temple to sanctify the Easter meals - eggs, cakes and other culinary delights. This Catholic holiday is an essential symbol of the suffering, death and resurrection of Christ, who gave his life for the redemption of the sins of the mankind. The main attribute and the main gift on the Easter is eggs coloured in red. And no wonder. Since the ancient times, egg has been a symbol of the infinite life. Housewives paid special attention the Easter table decoration, trying to make as many different dishes as possible that are an evidence of wealth and abundance. May, 26 (the date for 2013, the date changes) – the Catholic Trinity. As the Orthodox Christians, the Catholics celebrate the Trinity fifty days after the Easter. This festival was introduced the Catholic Church in the XIV century. The Trinity represents God, which is presented in three persons – the Father, the Son and the Holy Spirit. In honour of the Holy Spirit, which is the beginning of a life-giving, solemn worships in Catholic churches are held and homes and Catholic temples are decorated with flowers, herbs and branches. December, 25 - Christmas (Catholic, day off). This is one of the main festivals of the Catholic Church, which was introduced in the liturgical calendar of the church to the memory of the birth of Jesus Christ in Bethlehem. Christmas is a long enough sacred holiday. According to church tradition it is preceded by five days foreholiday- a strict fast is observed during these days - and six days of postholiday. On Christmas Eve, December, 24, a particular strict fast is observed. It ends with the appearance of the first star in the night sky. From that moment, the celebration of Christmas begins, a liberal table is laid that cannot be imagined without "Christmas bread" - so-called special wafers consecrated in Catholic churches. In Catholic churches, on the day of the holiday, the services pass three times - at midnight, at the dawn and in the afternoon. Three services symbolize Christmas in the bosom of God, in the womb of the Mother, and in the soul of every believer. In Catholic churches, on this day, they stand manger for worship in which the baby Jesus figurine is placed. Some religious people exhibit similar composition at home also. The Christian traditions of celebrating this day was mixed with folk traditions also. For example, villages store the custom of go round carol-singing on this day: caroling participants dress up in masks and animal skins, taking a masked goat with them visiting homes with jokes, rhymes, songs and small presentations. As a rule, the owners present gifts, food and warm words to the caroling.